Very sad. My wife was just saying today how every time she really liked a radio station it ended up going away. Also I’ve noticed when a new station starts up, the music is really good for a while to get people hooked, and then it gets watered down after a while to the same mix of bland crap that 5-10 other stations in the area are already playing. The main exception is KGB for classic rock, every other station has modern pop crap mixed in with the good older stuff. These days I play MP3’s on my phone when I want to hear music, or turn to one of the two big AM talk stations in the area (KOGO and KFMB) when I want to hear live human beings, or when I’m visiting family in Texas there’s still WRR for classical or my old college’s station KNTU for jazz. Radio programmers are incredibly conservative, afraid to do anything that might even make someone in their target audience think about changing the station. There are still some great stations around, but they’re fewer and farther between. My favorite local station is now part of a big national conglomerate. I listen at work but it is just backdrop. In my car, I have satellite. That’s good and bad. I miss good radio. Me too. I have concluded that its time is past. Time to look for the next great thing. Even with all of the new ways people get their music and news, local radio could have stayed relevant. Perhaps there wouldn’t have been as many signals on the air, but bright programmers and sharp talent would have kept a station or two on the air in each market that delivered content with a local flavor. Enough people would listen to provide advertisers with good return on investment. Radio would have morphed into something new and fresh. That didn’t happen and radio is dying a slow and undignified death. I agree with you. Deregulation made radio a big business that ate itself to stay alive. It didn’t have to be. But it’s what we got. They actually let the DJs program their own stuff, and these guys have an encyclopedic knowledge of music. The format ranges from the newest stuff out to classic rock, usually blended together amazingly well. I listen to them daily, as I used to listen to this channel when I lived out there. And being that they are public, they are commercial free and not beholden to advertisers. It really may restore your faith in radio :). Sounds like fun! I’ve bookmarked the link and will give it a listen. There seems to be too wide a chasm between community radio that’s so eclectic it’s hard to listen to casually, and corporate radio that can only be listened to casually. Now i learned something new, the portable people meter. But now, who wears one? The Nielsen Company is who rates radio stations. They have a methodology somehow for choosing people to wear the device. I believe there’s some modest stipend for doing it. I could use some of those modest stipend! I think deregulation was the main cause of the problem. I think stations could have remained locally owned and could have made plenty of money. We have one station in our area that has remained local because when the owner died she set up a trust to keep it that way. They are one of the few stations that still employs a large on-air staff. They also usually win the local ratings and seem to be doing well money-wise. I agree. I used to be a fan of deregulation in general, but broadcasting is the poster child for what can go wrong. The big companies are about making money in whatever way they find themselves making it. The local companies are about making money through doing good radio. 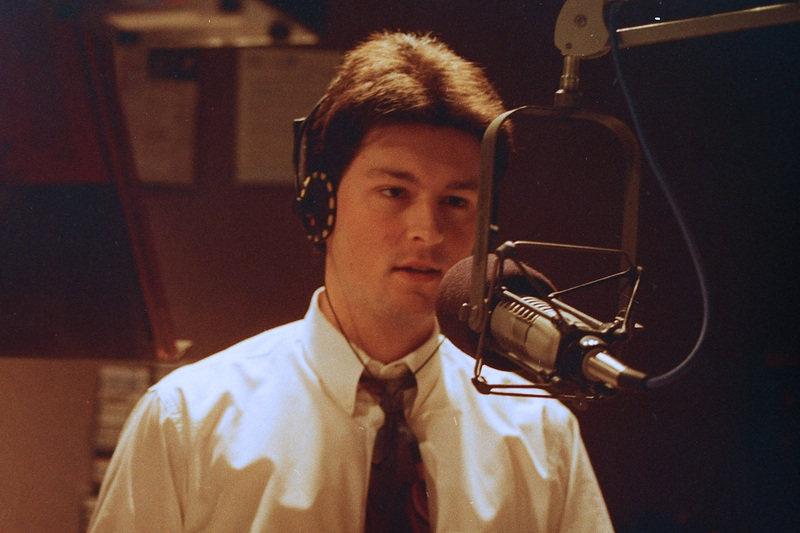 It’s so cool to literally get to hear you grow and mature as an on-air personality through your clips, Jim. It’s a shame you’re not on air anymore — you have a great voice and an engaging presence. It’s also a huge shame that radio has all but disappeared. Although in one way it’s great that consumers have so much choice now between online-streaming, satellite radio, and the few local stations that still limp along, there’s no longer that unifying sense of community and place that radio used to provide. Oh, well. The world is always changing, but at least you got to be part of something truly special while it lasted. Thank you so much, Heather, for complimenting my on-air work. It is kind of remarkable even to me to hear how I grew and got better at it over time. I had some good coaches in some of the program directors I worked for. They really helped me get better. Yes — it was special while it lasted. I will forever be happy I got to do it. It was a childhood dream realized. Ooh, yeah, FCC crackdowns and fines and maybe jail…. maybe it’d be better to set up an Internet “radio” station instead? Really, that dire? hmm.. but I thought pirate radio…nah! nvm! Good thing I wasn’t serious when I made that comment. Ah, but listen to those crisp “double-you”s…. Thanks my man! It was such fun. I miss it. Since you already have experience there, perhaps one day you could find a way back? The industry has changed so much, I don’t think I’d enjoy it anymore. I prided myself in my eclectic tastes in those days! EVERYTHING the FCC has done in the last 35 (or so) years has led to its current “predicament.” All FCC policies seem to favor consolidation and big business. The recent repeal of Net Neutrality is the most recent example. 45 years in radio. Just retired from the biz. The thought of another on-air radio job playing 400 songs over and over while chanting slogans, makes me nauseous. Consolidation in all industries has been a bad thing for the country. The FCC gave up in the 1990s on all the principles that guided radio and made it relevant.